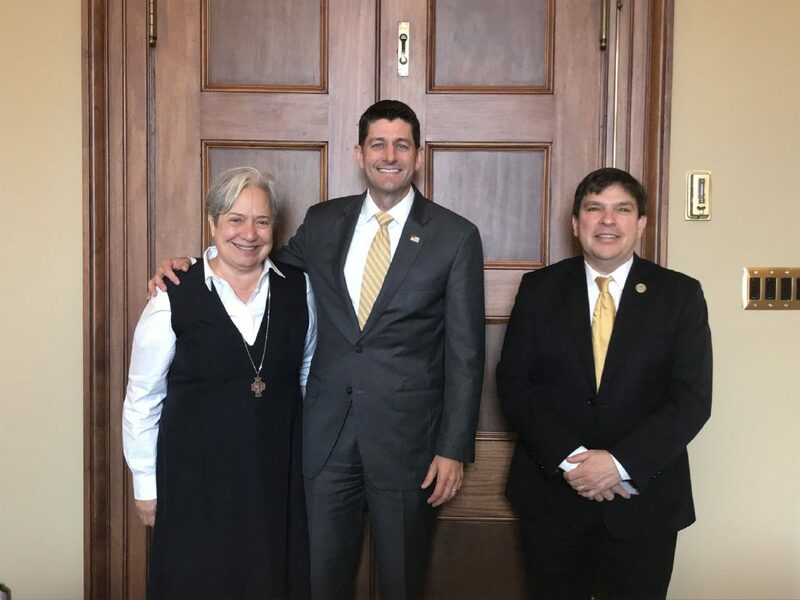 Sister Norma Pimentel, House Speaker Paul Ryan and Rep. Vicente Gonzalez met Thursday, June 7, 2018, about pending DACA legislation on Capital Hill in Washington, D.C.
Rio Grande Valley lawmakers and other local officials continue to urge for a vote on proposed DACA bills. Gonzalez and Pimentel pushed for Ryan to bring a vote to the House floor on legislation related to the Deferred Action for Childhood Arrivals program, which protects more than 800,000 people from deportation, and which was rescinded by the Trump Administration last September. Since then, lawmakers in Congress and the Trump Administration have proposed different immigration bills but have been unsuccessful in gaining the president’s support. On Tuesday, U.S. Rep. Filemon Vela, D-Brownsville, and Gonzalez announced they were signing “Discharge Petition No. 10,” which will set up a “queen of the hill” process to consider four immigration bills during a time when Pimentel, and other local clergy have supported Dreamers. The “queen of the hill” process would bring four different DACA bills to the House floor for a vote; whichever one of the four bills receiving the largest vote margin in favor would pass. House Leaders held a closed-door meeting Thursday morning, specifically to speak on the topic of immigration. If lawmakers can’t agree on a solution on DACA, voters could head to the polls in about three weeks without a plan for the nearly 1 million recipients of the program. The lone Democrat holdout is U.S. Rep. Henry Cuellar, D-Laredo, who said Thursday he’s lobbying Democratic leadership to strongly oppose a border wall before he will sign onto a petition. Cuellar said he met with Democratic leadership and believes the party leaders will more vocally oppose the construction of a border wall, which would lead him to signing the petition. U.S. Rep. Carlos Curbelo, R-FL, a leader of moderate House Republicans, said there’s a Tuesday deadline to force immigration votes. Just one Texas Republican’s name is on the petition, which he spearheaded. U.S. Rep. Will Hurd, R-Helotes, whose district borders Cuellar’s to the west, originally led a handful of House Republicans who weren’t pleased with where immigration reform was going. They initiated the discharge petition, a rare maneuver to bypass Republican leadership and bring a set of immigration bills to the floor for votes. Cuellar noted several times that he strongly supports young undocumented immigrants who came to the country through DACA. A group of House Republicans met privately Thursday, and Ryan told reporters afterward that there will be a vote on immigration in the coming weeks, though he did not get into the discharge petition, which nearly two dozen Republican lawmakers have signed. Monitor staff writer Mitchell Ferman contributed to this report.